Next-Gen Consultants: Meet Sawdie Fernandez-Singh - EM Marketing, Inc.
Editor’s Note: This blog is part of our latest “We Are EM” series, focused on a new generation of consultants. What does employment look like for Millennials, who came of age during the internet explosion and entered the workforce during an economic recession? Sawdie Fernandez-Singh has found the perfect balance of work and her personal life. As a part-time consultant, Sawdie competently coordinates LinkedIn's consumer research program while being able to spend quality time with her family. Sawdie slowed work down a bit while recuperating. But by the following month, she triumphantly noted, "Everything was back to normal. I had a newborn and I was breastfeeding and conducting the research studies from home via video conference." 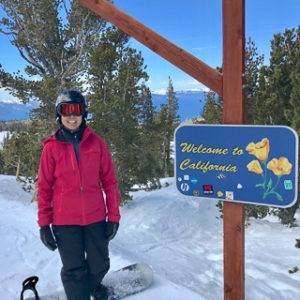 Sawdie Fernandez-Singh coordinates a consumer research program at LinkedIn, but truly enjoys time at home with her husband and two children. Sawdie appreciates technological advances that allow her to be connected and visible at a remote location. Technology helps her succeed in her current career, which is quite different than her previous studies in theatre, journalism, and international relations. She knows these fields typically require working at an office or traveling to different countries. After living in New York for 10 years, Sawdie got married and moved to California. She worked for some names you may have heard of: Stanford University, Google, and Facebook. While at Facebook, she had her first child and took extended maternity leave. But with the demands of being an executive assistant, she realized there would be less flexibility to allow her to continue spending time at home with her daughter. Enter a friend who had a proposition she couldn't refuse. This friend was also a new mom, working part-time at LinkedIn, mostly from home. There was an open position on her team to conduct research studies for about 10 hours a week, mostly from home. "It's perfect for what I needed," Sawdie said. "The work that I would be doing was very administrative in nature, very operational and very geared towards event planning which was right up my alley. I could do it with my eyes closed." Having a solid foundation of administrative experience, Sawdie still needed to prove herself. "When you're working from home, nobody knows what you're doing. But as long as I was responsive and responsible with my work, they knew that I was going to get the job done." She also credits having good bosses who do not micro-manage and let her develop and run the program on her own. The research program has been quite successful and has grown since she started in 2014. Sawdie hopes to continue working for LinkedIn, developing the research program to its full potential and making an impact in other areas of the company. Sawdie says that working in technology has allowed her to be home and be present, especially with a very busy husband. "My husband is a brain surgeon and a professor of neurosurgery at Stanford. Not only does he have to operate on his patients, but he also has to teach. He leaves the house around 7 AM and comes home by 10 PM every evening. If he's home before 8 PM, that's a really good day for us," Sawdie said. Having the ability to build her own schedule is the key to creating her work-life balance. But another favorable aspect is that she is personally raising her kids. "I could have hired a nanny. But I don't feel comfortable paying $25 to $30 an hour for someone to raise my child halfway. I'd rather do it myself for free, and do it well." Sawdie's relationship with EM Marketing started several years ago. Having been with LinkedIn for a year, she needed to switch contracting companies. Her previous company required her to take a three-month hiatus, leaving the role altogether before coming back. But LinkedIn did not want to lose the valuable asset she had become, even for that short period of time. Sawdie is thankful for EM Marketing which facilitates her contract and all the details surrounding it. She says EM Marketing has been "as attentive and kind and understanding as anyone could have ever been." EM Marketing's mission and her consulting experience have taught her to support other new moms in staying active in their careers while raising children. Once her kids are both in school, Sawdie plans to return to the office full time and if time allows, continue to consult in other professional capacities. Currently, she prefers being a contractor and is reaping priceless benefits as such. Kudos to Sawdie for finding the perfect role that supports the lifestyle she envisions for her family. What a great story – congrats Sawdie on building the life you want. I think video conferencing is magic this way. One note – while I totally applaud the choice of no-nanny, I do hope you have a fair amount of good sitters since little people love their time away from their folks… tho they’d never admit it to you!